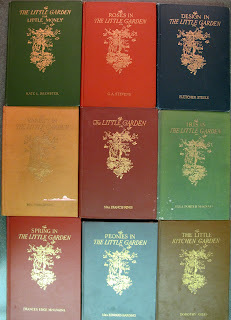 I fell into a giant rabbit hole of old gardening books and when I finally found my way out, I brought with me, all the way from the 1920's, the nine books in The Little Garden Series, written or edited by Mrs. Francis King. I was on vacation enjoying a late breakfast on a rainy morning. The day was unfolding slowly, as all good vacation days do. I noticed that there was a small shopping area across the road from the restaurant and that most of the stores sold antiques. Tired of all the outlet malls and t-shirt stores that seem to be the norm around vacation spots, I suggested we go over there to look around a bit, not to kill time, as that's just not a good thing to do, but to see if I could find something that heretofore I never knew I needed. We browsed a bit and the store owner asked if she could help us find anything in particular. "Do you have any old gardening books?" She thought for a moment and then with the help of her husband, pointed out a bookshelf where she thought some old gardening books might be mixed in with a variety of other books. I quickly found The Little Garden by Mrs. Francis King (1921), and though I knew I had one copy of it already, I decided to buy it. Then I found The Little Kitchen Garden by Dorothy Giles (1926), Spring in the Little Garden by Frances Edge McIlvaine (1928) and Variety in the Little Garden by Mrs. Francis King (1923). I was beginning to notice a little theme. I bought all four books. Later that evening, I looked through the books and realized there were five more Little Garden books listed in the last one published. 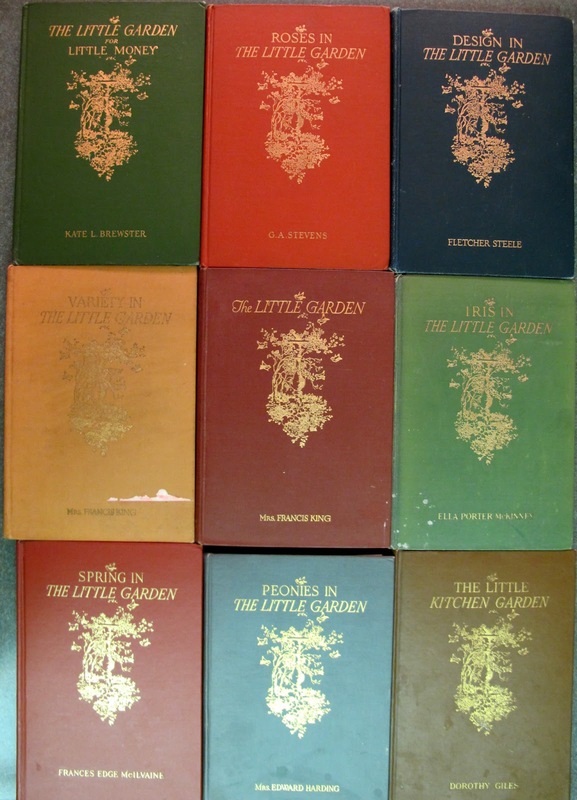 I confirmed through an online search for information on Mrs. Francis King, whose name is really Louise Yeoman King, that there were indeed nine books published in the Little Garden series. Today, the final book came and the Little Garden series has been reunited. I'm enjoying looking through these books, finding little nuggets of gardening wisdom. Some of this wisdom may eventually find its way into different blog posts or Facebook updates. I may put some of the information to use in my own garden. And I will probably include some of the nuggets of knowledge in a presentation I've titled "Wit and Wisdom from Old Gardening Books from the 19th and 20th Century". I've presented it to a couple of groups already and I'm scheduled to present it again in August. We'll see. And that's pretty much the story. 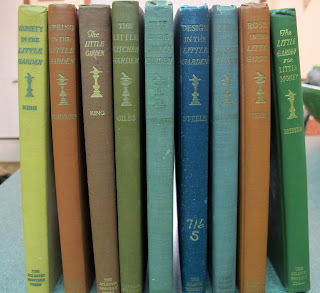 I have reunited all nine of the books that make up The Little Garden Series, written or edited by Mrs. Francis King in the 1920's. It's a grand set of books to have, if you enjoy old gardening books. Somewhere Louise Yeoman King is smiling about this reunion! Like old friends, all together again. Wonderful! Reading about gardening is just as much fun as gardening itself, you are going to have a lot of fun! Perfect colors and delightful reading no doubt. I love old garden books and these seem like a sweet set you've reunited! The colors and gold leaf on the covers are delightful! Congratulations Carol! Looking forward to hearing some of those nuggets! I love old books, so I totally get your old gardening book compulsion -- I mean interest. Good score! Looking forward to reading nuggets of garden wisdom!